Pope Francis recently called on young people to go and “make some noise.” Our Catholic Church is founded not on an idea but on a person and that person is Jesus Christ! He is fully alive in us and in the Eucharist. It is in the Eucharist where we discover real meaning in our lives; as Catholics, as individuals and as a community of believers. 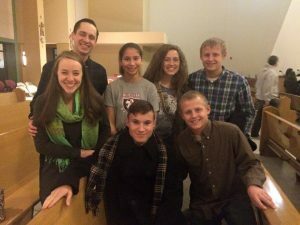 The Eucharist is the “source and summit of the Christian life.” Our youth ministry program challenges and prepares our youth to go and make some noise; in their hearts, in their homes, at school, in their parish and in their community by actively living out the Gospel. Our youth ministry program is for youth in the parish currently in 6th grade through 12th grade. Youth are encouraged to bring a friend. If you have a child with special needs, please let us know so we can accommodate your child, appropriately. All are welcome!